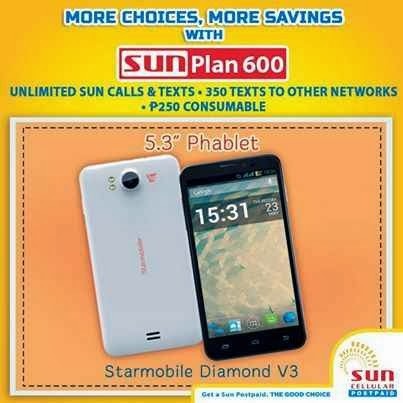 Sun Postpaid goes local brand smartphone offers with their latest gadget offering from Starmobile. Get this Diamond V3 phablet Android phone for free under Sun Cellular Plan 600. Enjoy 5.3 inch screen size smartphone with 12 megapixels rear camera and quad core processor for only 600 pesos monthly charge. This is the newest offer of Sun to add on their previous Sundroid Rush Starmobile Edition that hit last year. If you’re looking for an affordable plan that comes with good quality phone, grab this chance to own a Diamond V3 by visiting your nearest Sun Shop. See other Sun Postpaid Plan Phones. Sun Cellular continues their partnership of our local mobile like Starmobile, Cherry Mobile and MyPhone. Hopefully they will start offering some of the latest released local smartphone like Diamond X1, Cosmos X2 and Iceberg on their postpaid plan. If you’re interested to subscribe for this plan just comply to their Application Requirements then proceed to any Sun Shop or you can also submit your application online by visiting their official website at www.suncellular.com.ph. Do note that all submitted applications are subject to Sun’s approval and verification.